Long-billed Curlew populations of southwestern Idaho are declining at an alarming rate placing them on Idaho’s “Species of Greatest Conservation Need” list. With the use of satellite transmitter technology, the Intermountain Bird Observatory (IBO) is gaining valuable data as to why. 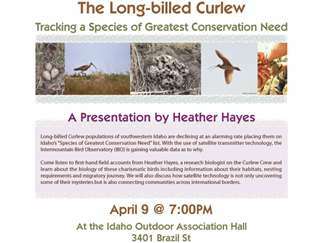 Come listen to first-hand field accounts from Heather Hayes, a research biologist on the Curlew Crew and learn about the biology of these charismatic birds including information about their habitats, nesting requirements and migratory journey. We will also discuss how satellite technology is not only uncovering some of their mysteries but is also connecting communities across international borders.